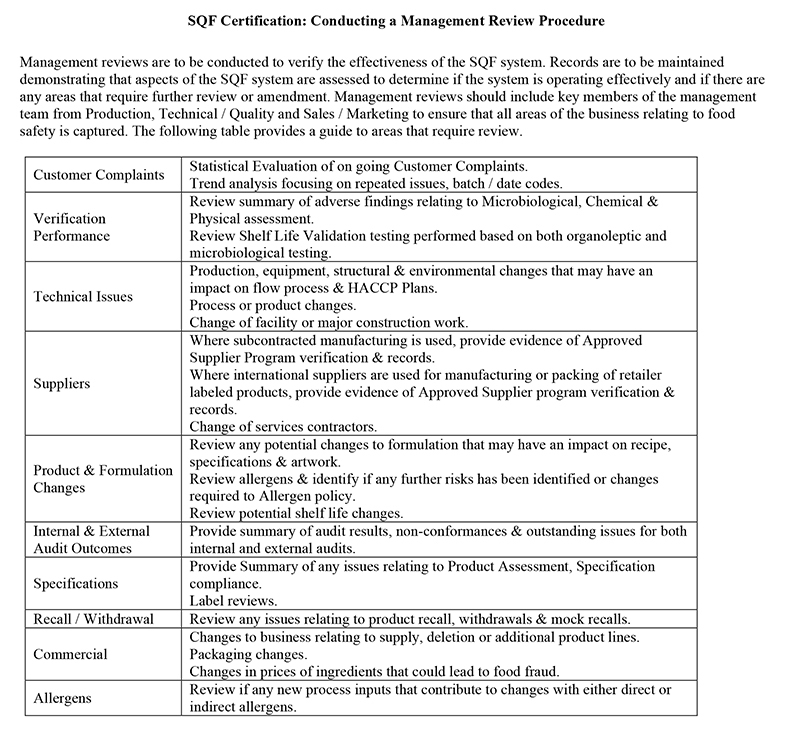 Regular management reviews are an important component of your organization’s commitment to SQF certification. SQF certification is an ongoing process; once you have attained it, you have effectively committed to a continuous improvement program for your business. Conducting regular, thorough and transparent management reviews will play a key role in ensuring that you continue to achieve your SQF goals. The first and most important thing to understand about management reviews is that they don’t have to be a cost to your organization. In fact, when conducted correctly, these reviews should become the cornerstone of your continuous improvement program, assisting you in measuring company performance against documented objectives. 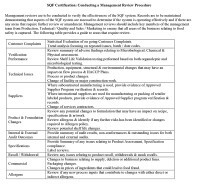 The management team is required to make adequate resources available for food safety and quality objectives and to support the development, implementation and maintenance and ongoing improvement of the SQF system (clause 2.1.2.3). This team must also establish processes to improve the effectiveness of the SQF system in order to demonstrate continuous improvement (clause 2.1.2.9). One cannot overstate the importance of thorough and effective documentation of the review, so remember the mantra: If you don’t write it down, it didn’t happen. Every aspect of your review must be clearly and thoroughly documented. These records are important documents in the SQF audit process and also as benchmarks against which company performance and subsequent reviews can be measured. Identifying objectives should be your first step. You cannot start collating data before you know what you’ll be measuring it against. Objectives are essentially short statements that outline what you want your company to achieve in specific business areas. They should encompass a whole-of-company approach in that they should contribute to overarching company goals rather than delivering a one-sided or fragmented approach to continuous improvement. It is important to note that objectives are neither mission statements nor warm and fuzzy statements. Measurable. They should outline specific quantities and quotas for what you are trying to achieve. Business-specific. Objectives should be relevant to the future of your business and to the individual business improvement process. Don’t worry about what your competitors are doing. Relevant. Make sure the objectives will have a significant and lasting impact on your business once they are achieved. This might mean choosing complex objectives versus taking the easy way out. Linked to a key performance indicator. Every objective should contribute to the company’s KPIs and be part of its broader strategic goals..
Clearly defined. Be clear about what you are trying to achieve and how you plan to achieve it. Documented. Write your objectives down! The review process, future audits and your ongoing improvement efforts will be measured against them, so it is important to accurately capture the details. Communicated across the breadth of the organization. Don’t make the mistake of keeping them in a filing cabinet somewhere. Put them in the lunchroom, put them in induction packs, hand them out during annual updates—share them with your team so that everybody understands the goals. a. What information must be extracted from company records? Think about the data sources that respond directly to the objectives you developed for your review. You should be leveraging the systems you already have to collate information, with a view to feeding the information back into work practices to create a loop of continuous improvement. b. What format is the data in and how can you make it accessible? Like most food companies, your company is likely to be home to a mix of paper-based and electronic data. Different data types throw up different challenges when it comes to data acquisition. Paper forms are easy for staff to use and easy for management to collect, but they require double handling in order to translate relevant data into a format that can be analyzed with any degree of depth. Electronic data collection is more useful when it comes to number crunching, but you need access to specific expertise when it comes to data extraction if you want your data to work effectively for you. Newer, more sophisticated data management systems will help automate data collection activities and will also ensure that your database systems can communicate with each other to share relevant information. Data access is another issue to think about early in the process. Who is responsible for all the different data sets that must be accessed for the review? Is he or she the right person to manage that data? Will he or she be available at the time you need to access the data before the review? c. Who will analyze the data, and do you have the requisite skills in-house? Another important element of the pre-planning process is the question of who will analyze the data once it has been extracted from your systems. Does your staff have the skills and time required to conduct effective statistical analysis? Do you have suitable software systems to support the analysis process? If so, you’ll need to allocate each data analysis task to a staff member, making roles, responsibilities and timelines for the analysis process clear. In addition, ensure that all managers have access to (and an understanding of) the previously identified management review objectives so they can target their analysis appropriately. If you don’t have the requisite data management skills in-house, you need to think through potential solutions during the pre-planning stage, whether it involves providing training for staff or bringing in outside expertise. Prior to the data analysis process, you should also be looking at your raw data and reviewing data outliers (that is, data that lies above or below the mode)—these can sometimes provide interesting insights about your processes and procedures. It’s important to have an experienced quality assurance team on board before you start assessing your outliers; your QA team should already understand the variables within your processes and procedures, and will therefore be able to identify whether the outliers are one-off data spikes or trends requiring further investigation. Meticulous preparation is key to a successful management review meeting. Ensuring all meeting attendees are on board with the agenda and meeting outcomes is a good way to get started. First, develop a written agenda and timeline for the review. Think about the timing of your meeting in conjunction with your unannounced SQF audit. Set the date of the meeting with enough time to ensure close off of the corrective actions issued as a result of the meeting. Yes, if you’re doing it properly, you should have corrective actions issued. Next, you’ll need to get all participating staff members up to speed with the review process. Pull together the requirements of the review, the relevant SQF clauses, customer requirements and company objectives, and put them into a document that can be circulated well in advance of the meeting. Identify the individual managers who will be involved with the review—that is, the managers whose business areas will make a contribution to, or be impacted by, the review process itself. Ask participating managers to prepare the data that is relevant to their key performance areas and to the management review objectives you’ve identified, as this will be distributed at the meeting. Objectives. Were they met? If not, why not? Do they need to be modified for next year? If so, why, and to what? The scribe should also be responsible for compiling all supporting documentation from the meeting for audit purposes and for review prior to future management review meetings. Once the review process is completed, any processes and procedures identified as requiring modification must be updated. This is also the time to follow up on action items—your meeting documentation should clearly show who is responsible for each item and their respective tasks. Engage with the staff members responsible for each item at regular intervals to chart their progress, and follow up again at subsequent management meetings to ensure that all actions have been completed. Communicating review outcomes is very important. Charting a specific course requires an understanding of, and commitment to, that course by everyone involved in the navigation process—and you need your team to understand where you’re going so that they can help you get there. This means communicating all the outcomes, both good and bad, to all relevant personnel, and taking the time to thank and congratulate staff who were instrumental in achieving positive results. The last step of the review process is to share your success—don’t let your hard work go unnoticed! Communicate the value of the review both to your team and your superiors, and demonstrate the link between the review itself and the achievement of individual, team and company KPIs. Clare Winkel has worked in the food industry since 1987. She has been HACCP training since 1995 and auditing in 13 countries, including Australia, Ireland, United Kingdom and the United States, since 2004. Winkel is currently working in the Australia and the United States in the areas of food safety, packaging and ethical auditing. Since 1994 Winkel has consulted and trained in the following areas: Seafood harvesting, farming and processing, meat processing, wild game harvest, food service, fresh cut, food packaging, and storage and distribution. Between 2006 and 2008, Winkel was a researcher on the EU project STREPS no FP6- 518451 “Developing a Stakeholders Guide on the vulnerability of food and feed chains to dangerous agents and substances”, which concluded with the development of a new risk assessment method to enable the farmed Atlantic Salmon supply chain to be assessed for vulnerabilities to food safety contaminants, including the assessment of traceability, documentation and failure to detect contaminants. Winkel holds a Bachelor of Science degree from Queensland University of Technology and a MBA from the Australian Maritime College. Easy to understand, and clarified what gets discussed, Thank you for this article and making my life a little bit easier in the process! !